Gilder Lehrman Collection #: GLC01595.01 Author/Creator: Halpine, Charles G. (Charles Graham) (1829-1868) Place Written: Hilton Head, South Carolina Type: Manuscript document Date: 6 June 1863 Pagination: 1 p. ; 22.7 x 14.5 cm. Summary of Content: Halpine, Assistant Adjutant General to General [David] Hunter, relates orders to Colonel Davis. 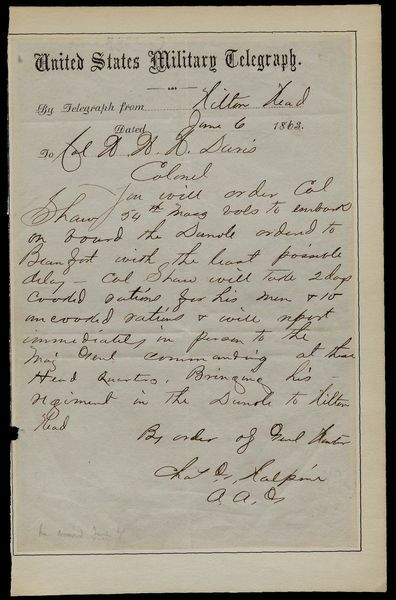 Instructs Davis to order Colonel Robert Gould Shaw, commander of the 54th Massachusetts Infantry, "to embark on board the [Demole] ordered to Beaufort with the least possible delay." States that Shaw should bring two days cooked and ten days uncooked rations for his men. Instructs Shaw to bring his regiment directly to Hilton Head. Written on United States Military Telegraph stationery.